It’s movie blockbuster Xmas movie season and there are several movies I would like to see. Creed 2, Ralph Breaks the Internet (with the kids of course), and….Aquaman?! Yes, believe it or not, I actually have some expectation to watching “Aquaman”. 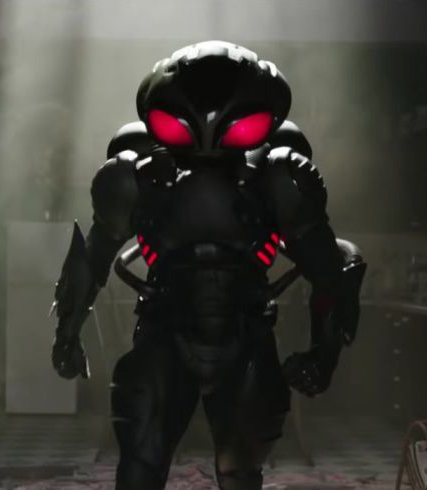 Yes, we have been beat up and berated by subpar DC movies with subpar villains…and once again DC has regained my attention with a more than rewatchable movie trailer…especially the parts featuring the perennial arch-enemy of Aquaman, the one and only Black Manta. This is the first figure I have purchased featuring Mattel’s new redesign of their DC Multiverse packaging line…and I like it! The color scheme was pretty eye catching and easy to find. 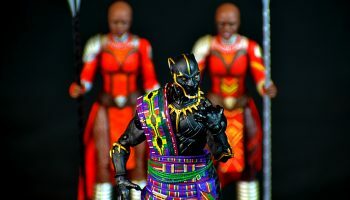 Walmart had it near the Hasbro Marvel Legends, and even though the selection is limited (four movie figures and two comic book figures as of this writing), I always ended up picking one up and looking at it. In all honesty, I don’t know if I was looking at the figure or the packaging. The front features a little indent towards the bottom of the packaging that makes it stand out in the world of boxy packaging. The black and blue color scheme is appealing. The figure in the window stands out. 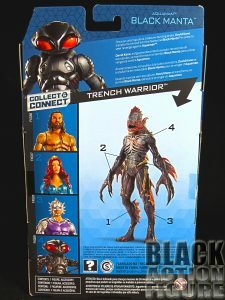 The back of the packaging is reminiscent of previous Mattel DC Multiverse figures, showing the figure at top with a bio-blurb, and the rest of the figures in the line along with the Collect-&-Connect figure. This is where Mattel loses me…unlike most Marvel Legends Build-A-Figures, this “Trench Warrior” figure is not appealing to make me go out and buy three more figures. At any rate, solid new packaging and at least for this figure it deserves some higher points for the new redesign. Can’t say I’m too much into the accessories. Outside of the head and body Collect-&-Connect pieces that we get, the only other accessory we get is a black sword. 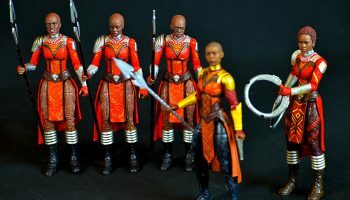 Mattel, of course, would not like for us to jab the sword in our eyes, so it is made of the softer plastic that once you get it out of the box, it’s a crap-shoot as to whether or not it will keep or regain a straight shape. 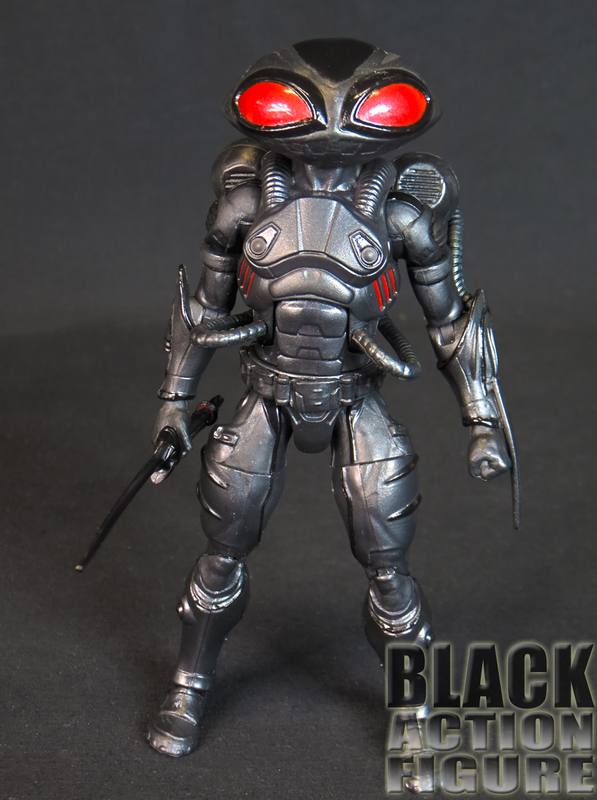 The black plastic also makes it lose any type of detail, making it look overly plastic. The sword, however, does look good in the figure’s hand. 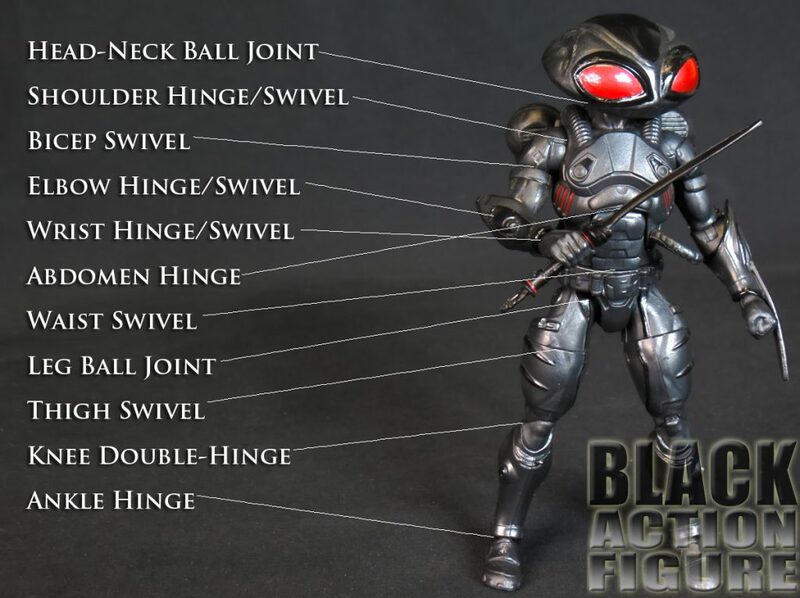 It goes along with the attached forearm dagger on the figure’s left arm. 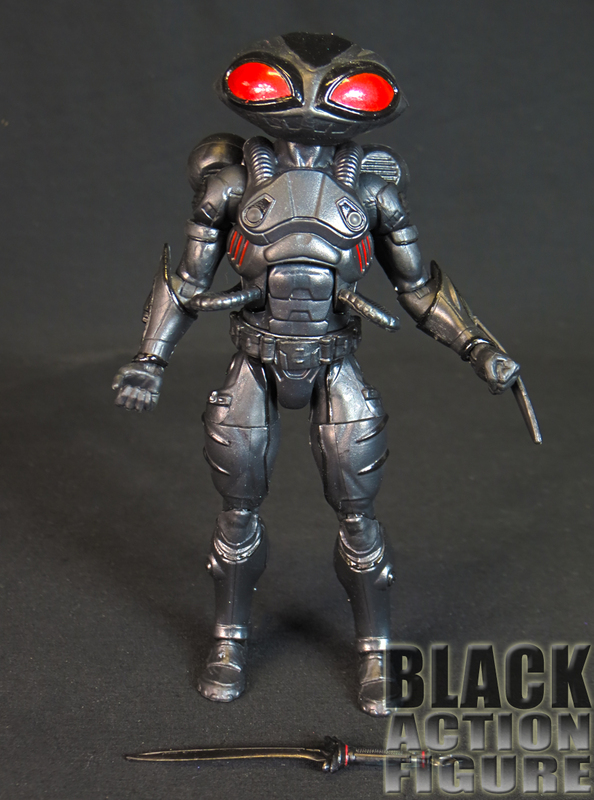 The hard part about grading this is that I’m grading this before I actually see the movie, so only the Lord (and several movie execs) have actually seen what kind of accessories would go with him. What are we missing? An exchangeable head would have been nice to see the actor’s likeness. And some removable eyeblasts would have put this category over the top for me. Let me say first that the sculpting is crazy on this figure. There is so much detail and variety in this figure that it reminds me of a Marvel Legends figure and not a Mattel produced figure. Is it perfect? No, not really. 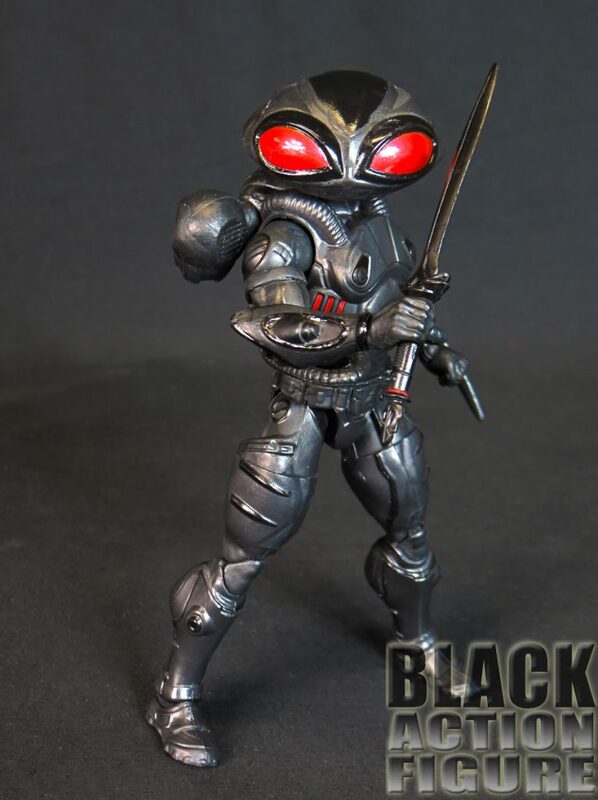 I suspect that we may get depending on the popularity of this film an SH Figuarts version which would make this one feel like the stunt double stand-in. We’ll have to wait and see. Is it worth $20? For me it was. 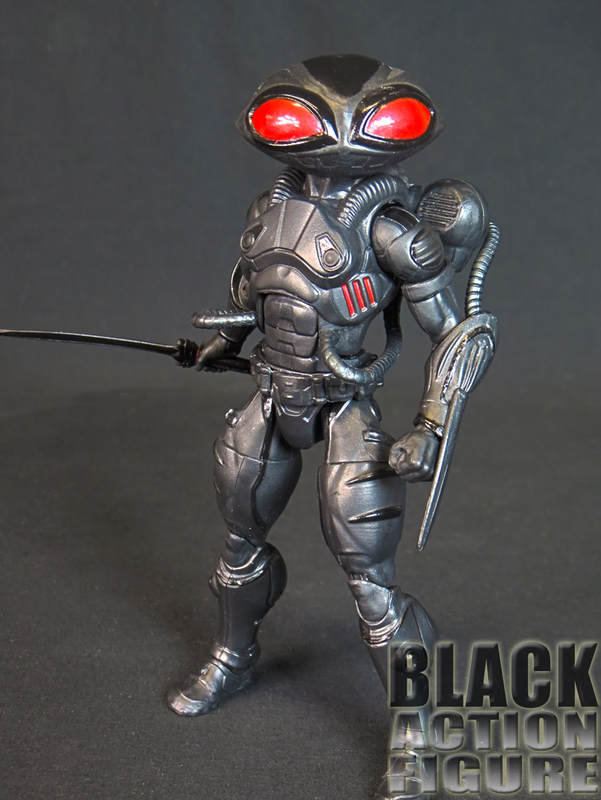 I love the Black Manta character, and this cool design was a no brainer. If you want a similar figure but don’t like the $20 price, check out the $10 version Mattel made for kids…it has less detail and looks like the cheapy plastic, but hey, we get what we pay for, right? 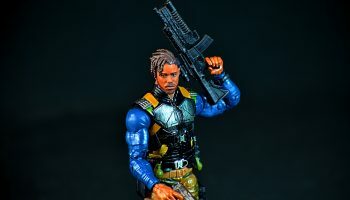 Mattel has come a long way from their DC Classics days, and they finally have a figure that is articulated similarly to a Marvel Legends figure, even to a point where standing them together on a shelf could perform some type of action figure unity. This figure has 27+ points of articulation…nearly to the 30 point mark we usually look for in most. Of course I check some of the regular points. The head can look slightly down, but cannot look up at all. 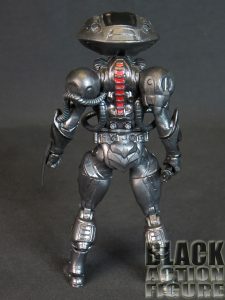 The arms have pretty good free range, even though the figure has a pretty substantial “scuba gear” on its back. The legs are pretty good as well, although I do find there is some loss of range in the double-hinge knees. Overall, I’m pleased. 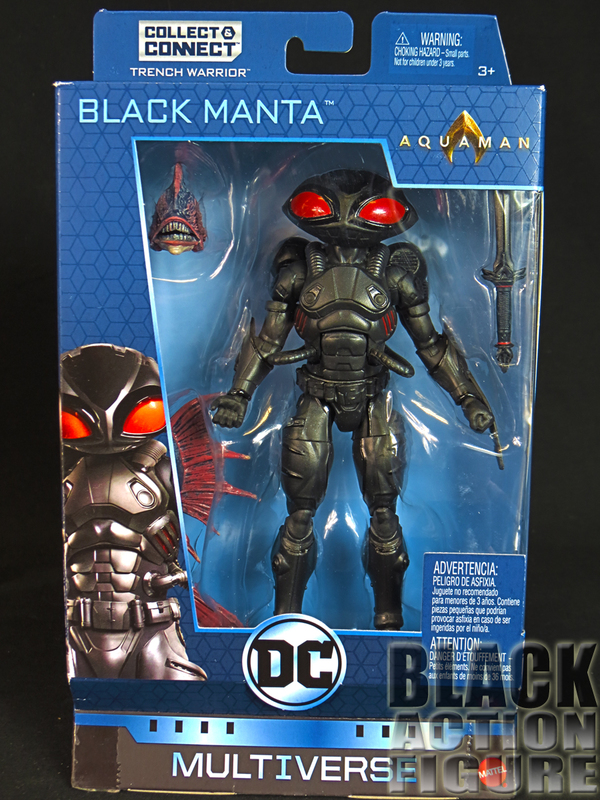 We’ll see how it compares to other figures in future DC Multiverse waves. 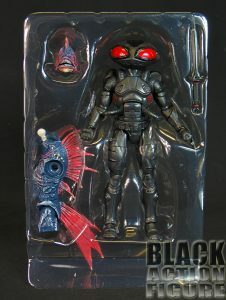 I’m not going to gush over this figure, but it is a solid entry from the DC Multiverse movie line. With Hasbro stepping up their game using their actor likeness technology, it’s only logical that Mattel does the same. I really wish there was more to this figure. It always seems that Mattel is getting close to what we want, then scale back to give us just below that line. I really wish that the Jason Mamoa Aquaman figure made me want to get it, but in all honesty, there is nothing appealing about it. I might as well wait until it is $5.98 at the local Ross store. I really like Black Manta as a character…he’s in my list of the top ten DC characters I like. I hope they use him in this movie as well as they used him in Young Justice. I hope that even though he is not the main villain, he shines in the movie. Be on the lookout in stores for this one. Hopefully like me, you won’t be disappointed.